Most fear the Virtual, for they cannot navigate its marshes. They dare not. They have heard many enter but few return. They cower in the Real. 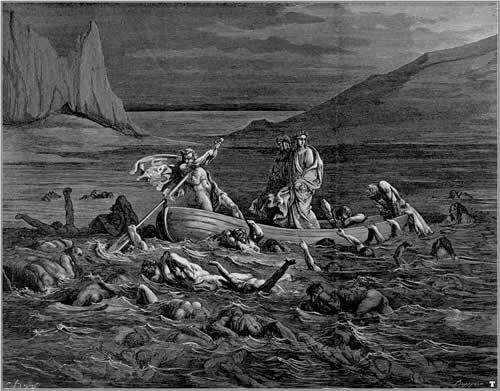 Some, a meagre cadre, need no Charon. By Herculean force they bypass the Cerberus of privacy and stride, freely exposed, on both banks. They are the proselytizers, the New Priests. They will set the way forward, and walk on, regardless of converts. The rest – and Typist is one of these – negotiate with the dark boatman for passage, and watch from the far shore as their avatar traverses a place they can never go, never touch, but always feel. There, in the Virtual, Fiend is Real – a entity independent from, but eternally bound to, Typist. Fiend’s history is not Typist’s history. Fiend’s friend’s are not Typist’s friends. But Fiend’s soul is Typists soul. And anonymity masks much but reveals all. a very deep and thoughtful insight… i have much to consider. I have had trouble putting this phenomena into words. You have done so much better than I. I ventured into the virtual, not afraid, but maybe a little overwhelmed. I am now embracing the differences of real and virtual identities and am comfortable with keeping them separate.